Evaluating the health of wildlife—and by proxy the ecosystems they inhabit—often comes down to taking key measurements of the animals’ “body condition,” including length and weight. But obtaining these measurements is labor intensive and invasive. This is especially true for leopard seals, which are challenging to locate and approach in the frigid wilds of Antarctica. Now, new research reveals that remote measurements of these seals from aerial drone photos may be just as accurate as traditional methods, while requiring way less time, effort, and money. Leopard seals are an “indicator species,” meaning their well-being can tell scientists about how the local food web is faring. That’s because as apex predators, they’re directly or indirectly dependent on every member of the food web. The seals hunt penguins, which in turn feed on krill (small, shrimp-like crustaceans). If the krill are in trouble, leopard seals will feel it, and that’ll be reflected in their body condition. Using leopard seals as a canary in the coal mine for Antarctic ecosystem health seems straightforward, but the seals don’t exactly make the process easy. They’re kind of hard to find, and their native Antarctic habitat is one of the most inhospitable places on the planet. That’s to say nothing of the fact that leopard seals are fanged, 1,000-pound anger-sausages with zero interest in being captured, prodded, and weighed. Sedation is needed, which carries an inherent risk to researchers and seals alike. Removing direct interaction between researchers and seals would get rid of a lot of stress on both parties, which is why a new study published this week in PLOS ONE is so exciting. Researchers used photos of seals snapped by unmanned aerial vehicles (UAVs, i.e. drones) to calculate seal body measurements, then compared them to known measurements to gauge the drone’s accuracy. The approach works great, providing accurate results without any seal pestering or long field hours spent manipulating an unconscious, half-ton sea grizzly. 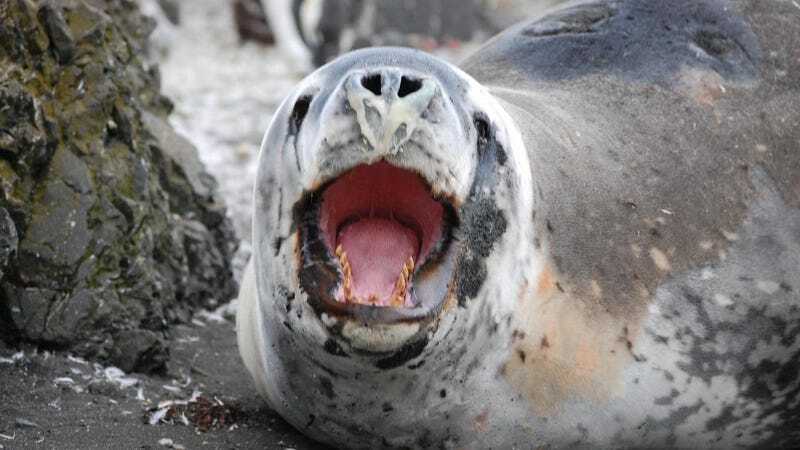 Scientists from the NOAA Fisheries’ Southwest Fisheries Science Center executed the study on Antarctica’s Livingston Island—a place where leopard seals haul-out in somewhat large numbers seasonally. There, they captured fifteen healthy, adult female seals, sedated them, and measured things like length and girth. They weighed the seals using a sling and a hand winch. Then, they administered sedative-reversal drugs to wake the animals back up. Shortly after, the team used a hexacopter UAV with a mounted camera to take photos of the seals from several different altitudes and in varied body positions. By using known features of the camera (along with altitude and scale markers placed near the captured seals), the team could calculate “photogrammetric” measurements of the seals based on the photos. Using body mass estimation models, they could also use the photos to help calculate overall body mass. The drone method turned out to be accurate within a few percent, for both length and mass measurements. That’s pretty impressive, considering the relative time and resource commitments. For each leopard seal, hands-on measurements took several hours of work and five people. But with the drone, data was collected in less than half an hour, with only two people involved. Bonus: the seals didn’t seem to even notice the drones above a certain height. This study fits into a rapidly-emerging suite of creative uses for UAVs in ecology and conservation work, all of which boost efficiency and cost savings in gathering crucial data through non-invasive measures. Drones have been proposed as a way to fly-by sample whale snot for insights into whales genetics and hormones. They’ve also been used to keep tabs on elephant populations threatened by poaching. UAVs are starting to gain traction for detailed, remote scanning and mapping of habitats, for instance, monitoring the Great Barrier Reef for coral bleaching events, or surveying imperiled orangutan habitat. The advent of cheap, easy-to-use drone tech may make many types of field surveys easier and quicker to execute going forward. Given the constant battle against time and resources for many species and ecosystems, that’s good news for conservation.